So you’re thinking about becoming a nurse? If any of this sounds familiar, you may be in the right place! Nursing can be a highly rewarding career path for the right person. On top of giving you a job you can love, the nursing industry is growing by leaps and bounds. It is typical for almost all of our students to have secured jobs even before they graduate! There are not enough trained nurses to fill all of the open jobs, so nurses are in a great position to be able to be picky about where they want to work, in what specialty, and even negotiate pay. There is so much variety in the field of nursing that it’s nearly impossible to get bored. You can tag team nursing with almost any other career. Do you enjoy traveling? You could be a travel or cruise ship nurse. Like being in leadership roles? Long term care Charge Nurse might be right for you. Enjoy kids or teaching? School nurse could be perfect. The opportunities are almost limitless. You could opt for the fast-paced environment of the ER, a somewhat slower-paced long-term care facility, or anything from clinics to hospitals, nursing homes to home health. 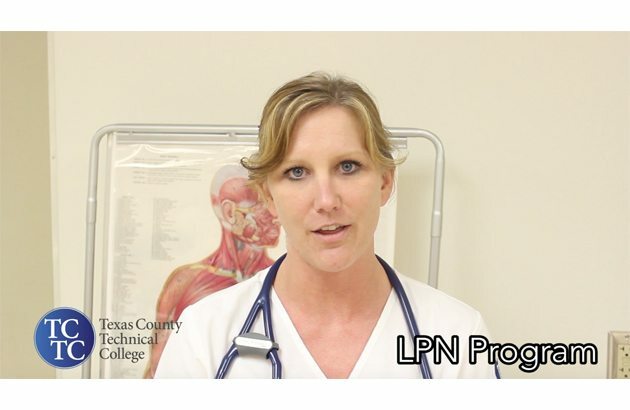 A lot of our students choose the LPN program because they can complete the program in 1 year, begin working as a nurse, and maybe bridge later to the RN program while still working. Additionally, our LPNs from TCTC are IV certified, so they can start IVs and administer IV fluids. This makes our graduates even more desirable to employers. Basic nursing skills, communication, and safety then practicing them on computerized mannequins. Medical math, administering medication, electronic health records, and confidentiality. Most of your learning will take place in the classroom and skills/simulation lab where you’ll practice on mannequins. At the end of the semester, you’ll be prepared to begin clinical rotations in the second semester. NCLEX prep : We’ll focus on study habits, test-taking strategies, breaking down problems, and begin taking NCLEX-style tests. IV certification – learning to start IVs and administer IV fluids. Learn each body system and do a brief overview of healthcare concerns, tests and diagnostic assessments. Review groups of medications, their actions and uses, therapeutic response, and side effects. Conception to adulthood and the diseases, disorders and care needed for those ages. You’ll practice skills in a variety of locations such as Peds/OB Clinics, Labor and Delivery, Walk-In Clinics, ER, OR, ICU, Wound Care, Cancer Center, Dialysis and more. NCLEX prep : You will apply the test-taking strategies specific to disease, disorders, and medications. Diving deeper into each body system and the diseases, disorders, and treatment plans. Disorders related to mental health, treatment plans, assessments, and evaluations. Working on leadership, management, and entering the workforce with resume, interview, and job-related skills. You’ll job-shadow a nurse for 45 hours and work with them, so you can experience their specialty in-depth. You’ll demonstrate your skill knowledge and clinical judgement at hospitals and mental health facilities with more complex patient care and patient teaching. NCLEX prep : You’ll be testing on mental health and preparing with video patient scenarios, taking NCLEX-style tests in all the major subject areas as well as the NCLEX Predictor, which should reflect your outcome as if you were to take the real NCLEX. You’ll then get tutoring specific to any weak areas you may have – all during the program! First come, first qualified, first accepted. Unlike other colleges, the bulk of your education here is focused on nursing. We do not waste your time with excess general education courses. By default, our gen-ed classes are built in and taken during your program. This is so you can complete the whole program in a shorter timeframe and get back into the workforce quickly. Unlike other schools, YOU CAN CHOOSE to take the gen-ed classes before your program begins if you would rather get some classes out of the way early. Some students prefer to lighten the course load for later semesters when the schoolwork gets more intense. We know it’s important for you to be confident in passing your licensure exam (the whole reason you’re taking the program to begin with)! Since it’s so integral, we built the NCLEX preparation into the program so you’re practicing for it throughout your entire time at TCTC. This is one of the reasons our students typically have VERY high pass rates: 2018 LPN to RN class – 100% and 2017 LPN class – 96%. After the conclusion of the program we have a NCLEX prep specialist come to our campus and spend 3 days going over material and practice questions.This is a resource that is unique to TCTC because of our complete partnership with ATI. This NCLEX review session really boosts our students’ confidence before taking the exam. Classroom learning is pointless if you’re not confident practicing your skills in real-life. We wouldn’t want to throw you to the wolves as a new nurse without any hands-on practice, so we make sure that after learning skills in the classroom, you have plenty of time and various scenarios to practice those skills…whether on a computerized mannequin that simulates real-life symptoms or on real patients at healthcare facilities under instructor guidance. You’ll practice your skills in a variety of scenarios at many different locations including Peds/OB Clinics, Labor and Delivery, Walk-In Clinics, ER, OR, ICU, Wound Care, Cancer Center, Dialysis and more. Our simulation and skills lab allows students to practice their nursing skills in a lower-risk environment. Instructors can make the mannequins show symptoms specific to certain health problems, while the students practice nursing skills on a simulation mannequin. This helps take pressure off of students and allows them to make plenty of mistakes before practicing on a real patient. Giving class time and instructor help with writing resumes, practicing interview skills, and other skills related to job searching. Having local recruiters and healthcare professionals visit your classroom and talk to all students about their facility and any jobs available. Constantly alerting students to upcoming career fairs and networking opportunities. Passing along job opening information from local healthcare facilities that approach us requesting qualified candidates. We’re a small school with small class sizes, close to home, and where everyone really does know your name. At some larger schools, you’re stuck in giant classrooms with an impersonal atmosphere and no help in sight, but at TCTC you’re a name, not just a number. Help is always available and our staff and faculty bend over backward to help out with whatever you’ve got going on as we help you navigate the waters of a nursing program. “I liked that the program was only one year because it gave me a chance to learn everything at a fast pace. There were a couple of schools that had programs that were around two years long and I knew I couldn’t really spend two years going to school right now, so TCTC’s one year PN program just made it so much easier. It didn’t seem too overwhelming, especially because the instructors cared about our time; if we didn’t have anything left to do in class they would give us time to work on homework so that we could get the most out of our day. The Practical Nursing program is designed to develop attitudes, skills and theoretical basis for competent entry-level practice as a Practical Nurse. Graduates are eligible to apply to take the NCLEX-PN licensure examination, and upon successful completion of the NCLEX-PN and with approval from the Missouri State Board of Nursing, become a Licensed Practical Nurse. Successful completion of the Practical Nursing program does not guarantee licensure (see section 335.066 RSMO). Assume leadership responsibilities appropriately in stable situations. Demonstrate attitudes and behaviors respectful to the client and his/her significant others. Apply scientific principles while implementing safe, effective, therapeutic and holistic nursing care. Function cooperatively as a member of the health care team while reflecting caring, conscientious, ethical and legally accountable actions reflective of the Practical Nursing (LPN) scope of practice.